This discussion is about "Wallpaper AD v2.0 - AdSenseExperts.com Exclusive" in the "AdSense Placements" Forum. This modification adds a so called Wallpaper AD to your forum. a Skyscraper Banner (160x600px) combined into one AD (See screenshot below). modification on other website is only allowed with prior written consent by me. To fully use the potential of this AD Placement you should use an AD Server. 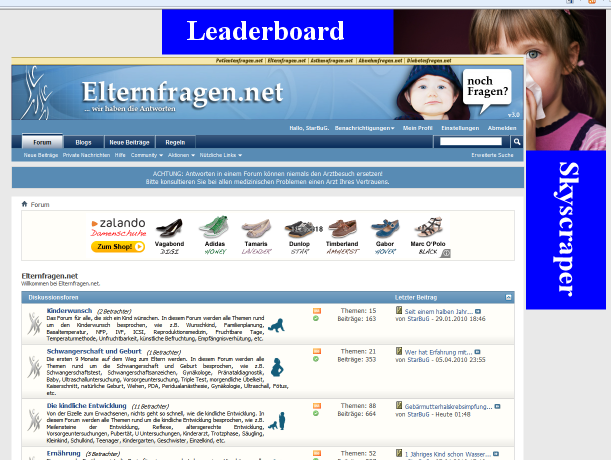 used by the leaderboard at the top of the forum is only filled when an AD is present. If you don't deliver a Wallpaper then your forum starts at the beginning of the page. with Wallpapers. Wallpaper prices are very often in the two digit CPM range. My forum is using a fixed width so this implementation is for a fixed width style. Like I said, my forum has a fixed width of 900px. The following CSS is for a fluid style. I tested it with a standard vB4 Style that is not modified. You maybe need to make some changes to fit your style. Go to your "Inventory" Tag and click on "Generate tags"
Feedback and optimization suggestions are very welcome! v2.0.1: Bug fix. Forgot the closing DIVs for the footer. v2.0: Complete code rewrite for maximum performance and better display. If you use an older Version UPGRADE! v1.01: Bug fix in CSS definitions that made it impossible to click on buttons in the header. This is a total code rewrite so I suggest everyone using an older Version to UPGRADE! The mod can be used on a fixed and a fluid style. I also explained how to set up a wallpaper ad using DFP Small Business as Ad Server. The wallpaper shows to every visitors 5 times per hour. is not shown, refresh the page 5 times. Could you help me to adapt your code so I could implement this? Get the firebug extension for Firefox and play with my CSS. I forgot the closing DIVs for the footer template. If you are using this mod please add the closing DIVs to your footer template. Have you tried this already on a fluid style? I have the problem that I get a horizontal scrollbar? I have tried it on a clean out of the box vbulletin fluid style. However I think I had to set the max. width to 95% or something. Can't remember. I don't use fluid styles anymore for a long time now. It's now more or less working. Do you know which is the most used resolution? I optimized my forums to 1024x768 and I think that would work for most users. If you use Google Analytics you can check which resolution your visitors use the most.